“I ABSOLUTELY love the ingenuity of these two sweep rowers! They placed two cameras at exactly the same location on their respective rigger. Then they superimposed the footage and it shows their ability to push together and their recovery discrepancies.” – Xeno Müller. Xeno adds that the rowers should listen to the sound of the wheels under the seats. When matching up the sound they would be that much closer to being fully in sync. He says it is the best way to get information on absolute body synchronicity. 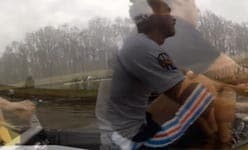 After watching the video, take a look at this article about how antiphase crew coordination affects rowing.